Are you ready to dig deeper into relationships at St. John’s, draw closer to Christ, and serve the community? Consider joining a LifeGroup. A GroupLink event to match small group participants is slated for Sunday, March 11, from 6:30 to 8 pm in Peeler Hall. 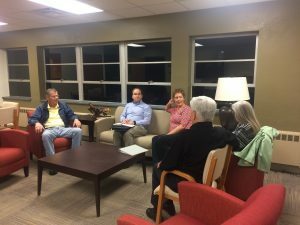 Participants will be brought together in groups of eight to 12 who are in the same stage of life or who hold a common interest, says Pastor Laura Henrik, who leads the LifeGroup effort as pastor for discipleship. For example, LifeGroups could be set up for young moms, for couples with young children, for singles — for anyone who wants a small-group experience within the framework of a larger congregation. Members who have agreed to be LifeGroup leaders will attend GroupLink, to help facilitate connections, Pastor Laura says. Four groups from the original GroupLink two years ago are still active. Members of all four groups have found value in being part of a LifeGroup. Jill and Wayne Nelson are in a LifeGroup led by Doug and Donna Groce. Mike Jacobsen and David and Julie Carr are also members. The group evaluated after one year and decided to stay together, Jill says, in part because Julie had just been diagnosed with stage 4 lung cancer. On Ash Wednesday, their LifeGroup ate the Wednesday meal together and then attended worship together. Willi Beilfuss’ LifeGroup still meets monthly to pack backpacks for Food for Thought. His group has lost members to death and illness, and other members have endured surgeries. They’ve also all had grandchild duty occasionally. Still, Willi says he is a proponent of small groups. “We really have an appreciation for each other,” and adds that shared tasks help solidify LifeGroups. Donna Weinhold continues to lead the Ladies LifeGroup, whose members include Gretchen Witt, Melody Moxley, Carol Pomeroy, Robin Cohen, and Linda Phillips. This group, which meets twice a month for dinner at Donna’s house, has a heart for service. They’ve cooked for the Comfort Food Ministry, participated in the Lily Pad Haven project, fixed breakfast at Rowan Helping Ministries, and taken supplies to Autumn Care. Lauren and Brad Stephenson are part of a LifeGroup led by Michael and Danielle DeNise. Other members include Corey and Jennifer Gebhardt, Ben and Kelly Goodman, Molly Connell and Penny Moss.